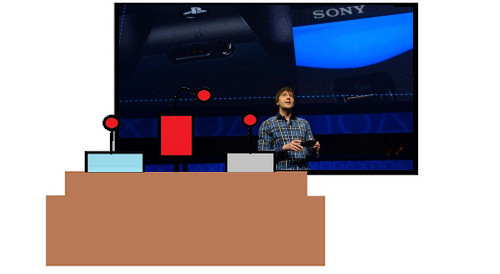 Did you see the PlayStation 4 press conference this week? Man, that was some riveting entertainment. So much so the entire staff is going to watch it again to take in all the goodness one more time. After that there's a bunch of other stuff on the plate including more Dead Space 3. I guess that game just won't "die." Nick Puleo (@NickPuleo) - "I'm hooked on NHL 2013's online teamplay mode, otherwise I might dip into Path of Exile"
Andrew Gaskill (@cubninja) - "I've got family in town, but I'll probably sneak in some more time with the Soul Sacrifice demo." Mike Katsufrakis (@Pheriannath) - "Looking at wrapping up Metal Gear Rising: Revengeance and hopefully getting some co-op time in on Dead Space 3." Marc Allie (@DjinniMan) - "Sort of in a gaming lull right now, but might finally play some Orcs Must Die 2 co-op with my kid this weekend." Jason Love (@JLove55) - "Progress a little further in Dead Space 3 and maybe start in on Aliens: Colonial Marines"
Eric Murphy (@smurph_em)- "I'll definitely play some Halo 4 and XCOM. Depending who's online, I might play Earth Defense Force: Insect Armageddon, Borderlands 2, or Syndicate. If I get desperate, I guess I could play Aliens Colonial Marines." Sam Tyler (@reelsamtyler) - "Time to sit back and relax. What, I'm only 50.4% of the way through getting everything in LEGO The Lord of the Rings? My partner will no doubt demand that we get the rest - immediately. " Locke Vincent (@LockeVincent) - "Are there other games than DOTA2? I kid! Checking out the Bloody Palace DLC for DmC and then getting some of the staffers together for a Syndicate date. " Tally Callahan - "A handheld game weekend for me, between Fire Emblem, Project Diva f, and Monster Hunter 3 Ultimate demo!" Chris Metz (@The_Lemko) - "Still working on Dead Space 3's campaign (co-op mode is taking longer than I thought), but might have some fun with Super Meat Boy and Spelunky." DJ Waaland (@FusRoDJ)- "I'll be playing Fire Emblem and Dark Souls this weekend. Also some Minecraft as well. " John Bardinelli (@itsamejohn) - "Extra time with A Valley Without Wind 2. Probably some Borderlands 2 as well, but that's a given just about any weekend." Page created in 0.8195 seconds.